There is one drawback to making new stuff - I'm reluctant to use it. I want to keep it pristine and then I tell myself don't be ridiculous, use it and enjoy it. I didn't plan to coordinate the projects, I was simply enjoying the effect of the felt on the grey linen and varying the combination of threads and stitches. There was no sketching out the design it all took place on the fabric. The felt shapes were cut freehand. I don’t always get it right first time, some don’t even resemble flowers, but those that do but are not the right style and size, are popped in a box for future projects. I started stitching before I’d finished cutting, with one rule; once it was stitched it was staying even if I thought, later on, it may have been better positioned. This meant I had to get a little more creative with filling in spaces with extra flowers and a butterfly. The dilly bag & needle keep. I used a combination of DMC Stranded Thread, Aurifil Cotton Mako Ne 12 thread and Aurifil Wool Thread 12wt. The felt is a wool blend and lovely to work with. The felt and linen is available from my online store. Just click on the links below. Sometimes you just know what to make. This was the case when I opened the delivery box the other day and saw these fabrics. I knew I had to make my favourite bag. It's simple, but that's how it should be as these fabrics are so gorgeous the design needs to be all about them! Started this morning and finished in time for lunch, it's the type of quick and easy project I love to make. This close up shows a truer colour. and can be purchased from my store. Do you have a favourite pattern, one that you keep going back to and never seem to tire of? 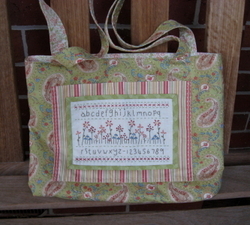 That's how it is with my Dilly Bag & Needle Keeper pattern. I couldn't decide what to make with this fabric. Then I remembered the dilly bag and thought it would be perfect. I love making this set and know I'm not the only one after hearing the girls who made it in last year's Red Treasures club commenting on how much they enjoyed making it. Some have made more than one to use as gifts. Would you like to make this set? You can find the pattern and kit here. I've been working on something new - just a little thing. Jan and Sue-Anne set me a challenge - I could only use four colours. It's been stitched with the Aurifil Cotton Mako Ne12 thread. Yes I am hooked on these threads. It was only when I pulled my sewing bag out in class that I realised it was looking a little worse for wear. Until then it still appeared (to me) as fresh as the day I made it. I actually felt a little embarassed. To me it's much loved but to others it probably looked a little, grubby. Made about two years ago, it goes everywhere with me and is used everyday. Any wonder it was looking a little tired and sad! The only thing I could do was make a new one. I didn't intend to make a red one, it just happened! It's always nice to see one of your patterns made in a different colour. Have a look Florence's blue version of Cherry Cream Squares. It looks fantastic. I might even prefer it to the red. How exciting, Joy has asked me to teach at The Material Girl. There's a two day Get Set for Christmas club and a day of Pretty Things. For more details go to Classes & Workshops 2011. Now I know this is a bit random and has nothing to do with sewing, but I cleaned out my plastics draws the other day. And found bottoms without lids and lids without bottoms. And I'm talking about 'good' containers, you know Tupperware. The take-away and ice cream containers all matched perfectly. Of course! So this poses two questions: 1. Why did I keep the take-away containers (I would've had a perfectly logical reason at the time) and 2. How did I manage to 'lose' bottoms and lids? Am I the only one this happens too! While I've been pondering this 'all important' question I did manage to finish the new project and am halfway through writing the pattern (that's probably wishful thinking). I have always had a bit of a thing for samplers so I'm hoping I'll find more time this year to design another one or two. I have other bag patterns but somehow I always come home with fabric for this one. Now I'm not really sure why this is. 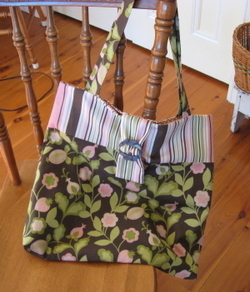 I think its because this simple bag style is 'all about the fabric'. And when you love such a beautiful print as this one why cut it up into small pieces. I also love quick and simple projects. With only two fabrics to coordinate - I don't have to think too hard about what's going where. It also gives me the chance to use a buckle from my great Aunt Ivy's sewing stash. But I think the real reason is you can shop for the fabric in the morning, have lunch with a friend, and still have the bag made by tea time.